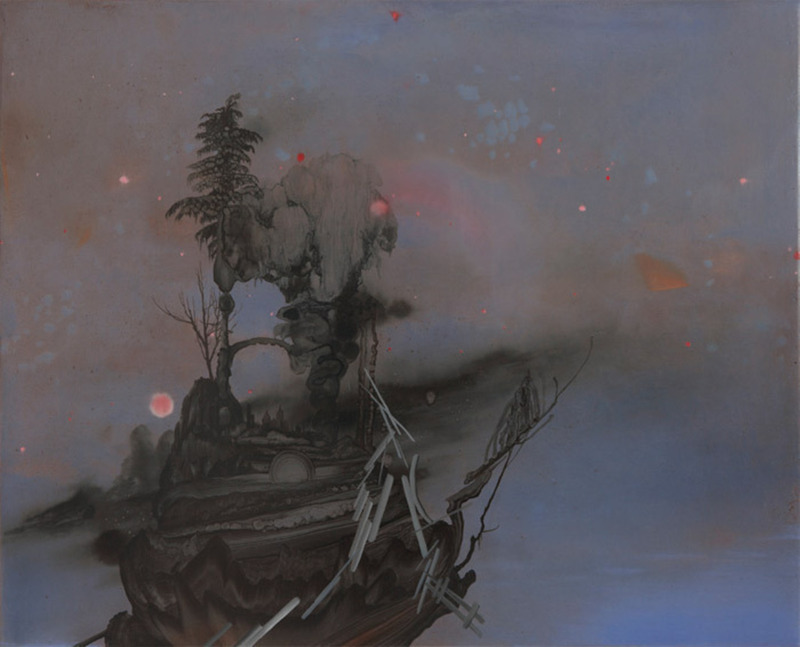 Darren Waterston, Island, 2012, oil on wood panel, 16 x 20". Grand, visionary landscapes unfold across the seventeen oil paintings from 2012 in Darren Waterston’s exhibition at DC Moore, all of which appear on gessoed wood panels (with the exception of Edifice, which is on canvas) and vary in size from large to small. The exquisitely strange scenes are based on nature. Meticulously drawn pine trees proliferate throughout, forming a dark ring around the luminous center of City of Sun, growing from a spindly, desiccated trunk in City on the Edge, or looming above an outcrop of rock in Island.